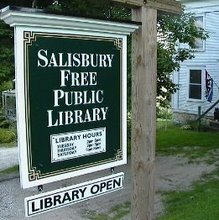 Salisbury Free Public Library: March and April Events! Middlebury College Professor Mark Stefani will discuss how the brain changes throughout the life span and discuss things we can do to can keep our brains alert and useful as the years go by. Irena Sendler rescued 2,500 Jewish children from the Warsaw Ghetto in Poland during the Nazi occupation in WWII. Her name and deeds were mostly unsung in America until a group of Kansas teens found out about her story and made a play about it. Jack Mayer, a local doctor and writer, wrote a book (Also called ‘Life in a Jar’) about Irena and also about the teens who wrote about her. We discussed the book last year. This year, in honor of Yom HaShoah--the Jewish day of remembrance of the Holocaust, we will gather to eat a meal of Polish food together and then watch a screening of the DVD that shows the play the teens created. With your help, we are updating our collection! Here is a list of books we would like to have!